Taqueria Zorro in North Beach offers cheap Mexican food at all hours of the night. 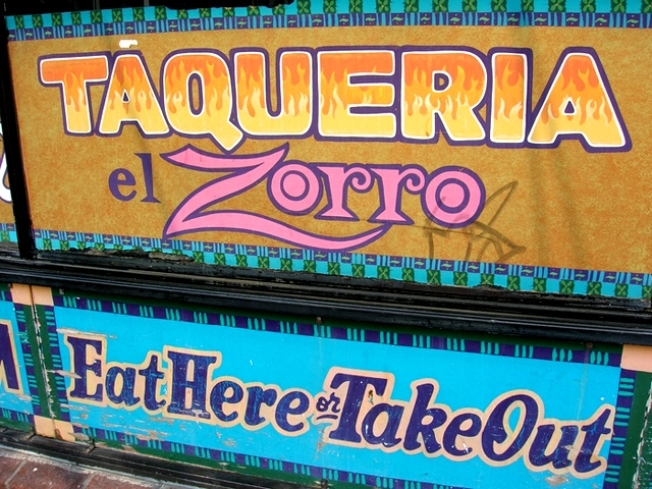 If you take a short walk up from the Embarcadero and you peak your eyes open at just the right time, to avoid seeing in all those nudie bars, you will catch a glimpse of a glowing sign that reads Taqueria Zorro. There is no need to rub your eyes twice,. You did not take a wrong turn and end up in the Mission. That really is Mexican food you are seeing in North Beach. The hipster, late night hang out is not just for Italian anymore. The former home of the Beatniks may be known for its fine Italian food, coffee shops and adult entertainment but believe it or not there is decent Mexican food to be had as well in North Beach. Taqueria Zorro may feel more at home in the Mission but for 12 years the simple Mexican joint has been serving partiers and drunkards much needed food, fast and relatively cheap, into the wee hours of the morning in North Beach. While the food may be priced a bit higher than other tasty more popular Mexican restaurants in the Mission, this one has everything you would need, including Mexican, high fructose corn syrup free, Coke in the glass bottle. The Super Veggie Burrito is a real delight for veggie goers and the menu is filled with food for carnivores and fish eaters as well. The restaurant is simple and the food is best to go. But if you need a spot to sit there are plenty of seats in the backroom. You might just have to put up with loud Spanish music blaring from a jukebox and your occasional drunk bum (is chemically blessed homelessly challenged person better?) sleeping in the chair next to you. There are some interesting pictures of old Mexico and a couple of nice murals on the wall as well that can keep you entertained if you have had too much too drink. The place does not look super clean outwardly but we can happily report that they close for a day and a half, every so often, to scrub everything in the restaurant. Whether they clean between those massive deep tissues massages or not we do not know. But one Yelper may have summed up the place the best when she wrote, "Great cheap Mexican food open where you need it." Monday through Thursday 10:00 a.m.-1:00 a.m.
Friday through Saturday 10:00 a.m.-3:00 a.m.